Summer sure is a lot of fun, all the outdoor time, biking, hiking, walking, gardening, golf, and pool time but oh goodness my tresses go into dire straits as the sun and my highlight color takes its toll on. While the sun is shining, by July my hair sure is not and I need to transform it from vapid to radiant, but how? I have a new product line to introduce to that is frugal in price, big in shine and readily available all over the United States. Get ready to have hair that shines, offers dimension in sunlight, and provides strength and moisture to get those locks healthy at prices that won’t squeeze the life out of your budget! Life happens, and we style, fuss, color, curl, straighten, and just wear our hair until it is less than resilient. Let’s face it, when you get a haircut, color, or service your styling technician sends you out looking great. The stylists use products that delight our sense of smell and that work well with your hair. You may not be able to replicate the process at home because somewhere between the cost of the cut and the price of the products you are into small debt and you can’t afford to purchase the products they are using on your hair! You actually can afford to treat your hair right, and get that salon look, everyday and where you can purchase the products, and the products you can purchase there are what make the difference! Sally Beauty Supply is a store that hair stylists shop in, and buy products for their own salons. Next time you are driving by a Sally Beauty supply, I truly suggest that you stop because it’s open to the public and it can be the frugal difference between tresses that show you off, or tresses that show off your failed attempts. I don’t believe in the traditional brands because they have a lot of ‘ingredients’ in them that strip hair of what it needs most, moisture. You might also notice that the national brands cost quite a bit of money and that it is hardly frugal to maintain your hair with the prices that are charged for products that don’t offer a great return on investment. I like stopping into Sally Beauty Supply and purchasing products because, these products are also purchased by your hair technicians who use them in their salons to get ‘that look’ that you walk out with! What you are about to find at Sally Beauty are products that offer great results at bare bone pricing. All of these products are Under $10 each and the results might have you doing more of your own hair and spending less time in that salon chair because you will find your hair is manageable after all! The feature products for your consideration this month are Biotera Weightless Shine Shampoo, Weightless Shine Creme Conditioner, Weightless Shine Deep Replenishing Masque and Weightless Shine Oil Treatment. Weightlessness is key to perky looking hair and Biotera delivers smoothing and radiance-boosting elements to revive your lifeless hair while providing a super-sleek finish. Here is how these products will work together to have your hair looking lustrous, life loaded, and sleek! Get ready to have instant shine, have no more tangles, smooth that frizz, and have hair that is glossy, soft, manageable and silky to touch! The Biotera Exotic Oil Collection utilizes Moringa Oil in its ingredients. Moringa Oil is native to Africa and India and it provides precious oil that nourish hair, offer smoothing properties all while increasing the radiance of your hair. The shampoo is colorless while the scent is fresh, and clean. 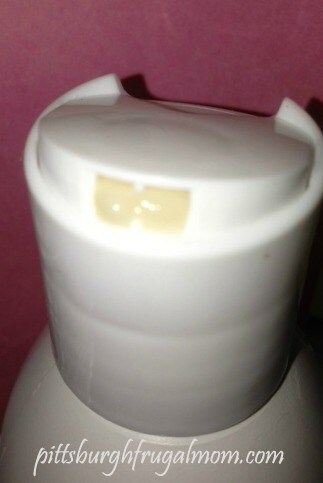 The bottle has a flat head, that when depressed opens on one side for dispensing. the bottle can be placed upside-down in your shower holder if you so desire and if you are looking to get every drop out of the bottle dispensing is easy because you just turn it upside down and open the top, so you are sure to get all the shampoo out(no waste, very frugal). If you have colored hair, highlighted hair, frizzy, dry hair, this is a weightless formula that has Moringa Oil in it which actually nourishes and provides a shine to those dull locks. There are no special directions, just wet your hair, drop some into your hair, lather and rinse! You are going to love the salon-like results and scent. This conditioner also has Morninga Oil in it, so it will create shine, manageability, while detangling and restoring and providing light-reflecting shine to your hair. Again, it is safe for colored hair, dry hair, frizzy hair. I use this 5 days a week. It is creamy beige in color and again the dispensing lid is push on one side and it opens the other. You can invert this bottle to sit in your shower dispenser holder if you have one or just invert it when you get to the end of the bottle to get all the conditioner out. The scent once again, is light, fresh and clean. You won’t have a perfumed scent with this collection. Was my hair weighed down? Nope and I use it daily! In between conditioning with the Weightless Conditioner, I add this into my routine and I eliminate 2 days of regular conditioner. The Weightless Shine Deep Replenishing Masque actually boosts the shininess and manageability. I have curly coarse hair, that has some color in it and I honestly style for photos, meetings and work daily which is extremely hard on my hair, so I feel that I owe it to my hair to give back a bit of nourishment that I swindle from it each day when styling. I let this set in for about 3 minutes and then I rinse out. It is amazing how soft my hair feels when the treatment is done! 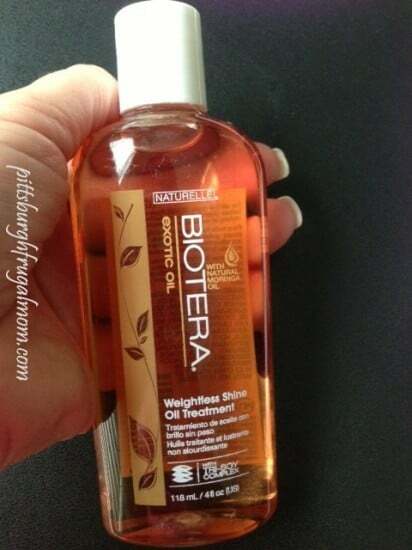 Now if you are a styling diva, the Biotera Exotic Oil, Weightless Shine Oil Treatment is a must have! This oil will revolutionize how you do you hair because it can be used with shampoo, conditioner, while you are are styling or on wet hair as a leave in treatment, it is all about the result you are looking to achieve! I personally can’t stand the flyaway thing, and my hair, curly coarse and fly away all seem to merge together. If I want to boost the frizz control, I simply add a few drops to the palm of my hand, and rub it through my wet hair before drying. Once dried, and once I get all the styling finished I add a few more drops to the palm of my hand and all those fly away frizzies are no where to be found! The key to this is not over-doing the oil. It is a few drops to shiny hair that is frizz free, so a little goes a long way. This is a versatile styling treatment and can be used wet, dry, or even with conditioner depending on how much control you need. Once it is in the palms of my hands I kind of just form an ‘A’ over my head and rub down each side of my head, and when I am done, the results are salon perfect! If you are going out, and your legs need a little shine, again, rub a few drops between the palms of your hands and spread it over your legs, you won’t believe the look! If you are traveling into hot, humid places, bring this along and you will get rid of that ‘frizz’ that seems to happen only when you travel, it is great for smoothing. Frugal salon looks are available to the everyday consumer, check out this line at your local Sally Beauty Supply!